Are you planning to revamp your drawing room and want to add some unique and beautiful decorative items? Then you should definitely go for this stunning picture frame of a lion in gold foil. This picture frame will enhance the look for your drawing room by giving it a royal look. This photo frame of a lion is made up of gold foil which makes it very attractive. This gold foil picture frame is made up of MDF and canvas. Apart from adding a royal touch to your drawing room this painting will also boost your spirits and make you feel like a lion, who is the king of the jungle. The size of this photo frame is so that it can be hanged on any wall you wish to. The main attraction of this photo frame is that it can instantly energise the person who looks at it and makes them feel determined and motivated to overcome all difficulties in life. This masterpiece is definitely going to add a positive energy in your house and among all the people who will see it. 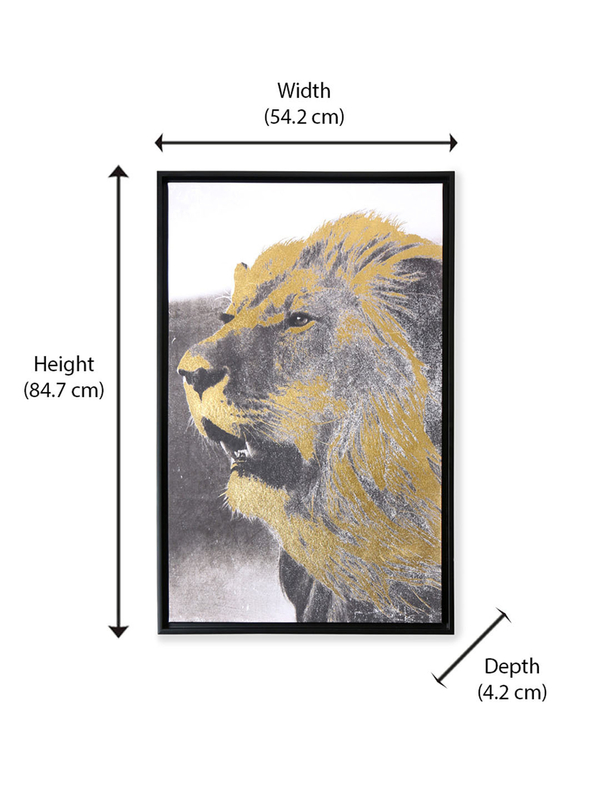 So, if you are in a search to buy and add a unique photo frame to your home which will give it a royal look then search nowhere and buy this stunning beauty Foil Lion Bold 50X80CM picture frame @ home.